The 3.0 version of Tiki Golf 3D from Arb Studios is just as fun and imaginative as the mini golf game’s original incarnation. Sadly, though, the new edition requires ample bug fixes before it’s up to par. Swing Time: The 3.0 version of Tiki Golf 3D features the good graphics and great sound of the original along with other enhancements. But some bugs need to be ironed out. Like the original version, Tiki Golf 3D 3.0 has you take on the role of Bobby Tiki, a golfer who must win back the artifacts taken by the gods Lono and Kahuna. Throughout the course of the game, you’ll play in three game modes (Tiki Putt, Time Trials and Pineapple Adventure). Once again, good graphics, great sound, prizes, ramps, power-ups, and obstacles help you along the way and unlockable levels make a tried-and-true premise unique and fun. The 3.0 version promises online leader boards, an improved interface, and performance boots, among other enhancements. Sadly, there are more bugs in this release than the initial version. While you can manually aim the game’s camera, a resurfacing bug sometimes places the camera at a low, almost useless angle with each new hole. Limited settings control only whether the game’s sound is muted or not (a calibration mode would be useful), and the game crashed on occasion if a ball was shot out of bounds. There are some great ideas at work here that make Tiki Golf 3D 3.0 a fun way to kill 15 minutes. 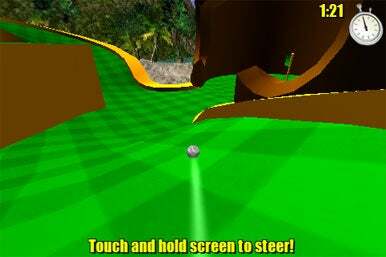 But until a group of testers wipes out the glaring camera bugs and improves the game’s stability, Tiki Golf 3D took a small step backward with this release.